Are there waistcoat blocks out there for rather corpulent women? I have a client that is about 5'3" Chest 43.5, bust 47, waist 47.5, hips 49.5. She does not want a potato-sack fit. I have some ideas on how to cut for her and since she has agree'd to multiple fittings to get the block right i am confident, though I would like to have a good starting point. Sounds like a fun challenge. It's better to create a block just for her since the concentration of body fat can be so specific. I have seen a french dart silhouette do very well on this type of figure. On such a petit/plus figure the minimal style line that the french dart creates is very flattering without over powering. You will get nice shaping and the garment float nicely over the abdomen. If the clients bust is the prominent area of the figure you may need to use a princess line to get the shape and fit you need. If you must add a side bust dart to the princess panel and it is more than 2" depth you may want to cut out the excess or press the whole dart up. This will help create an illusion of a more youthful bust line. cheers, but her belly is the prominent feature in this case. 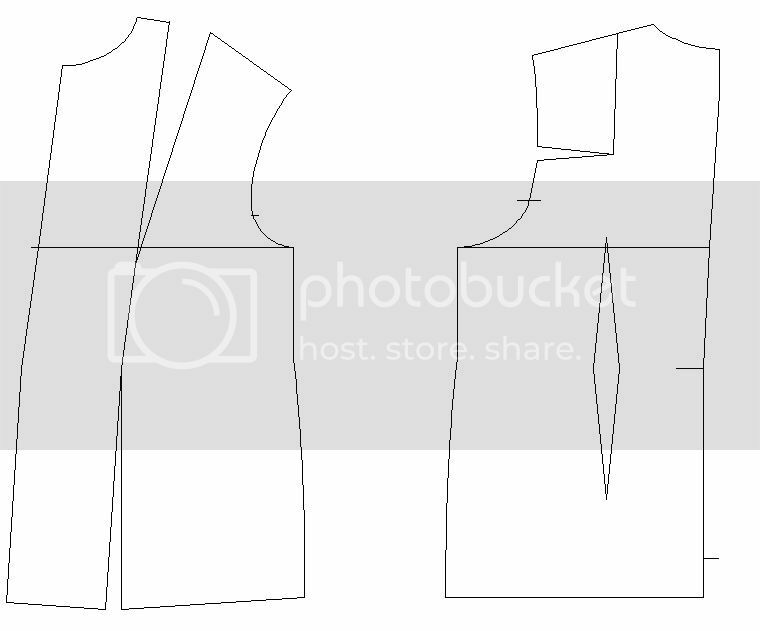 I'm starting out with a bit of a corpulent coat draft and then marking out a wc from that. so this will give me 4 panels to play with at the fitting. never the less it would be neat to see a larger woman's draft for a wc if any exists. mac, may i suggest cut a muslin tole in a princess line. either to the shoulder or curve to the armhole. cut as you wish through the bust line. then leave the bottom open and pin over the lower area as you fit her. this is a cross between drafting and draping. then make a corrected second tole before cutting cloth. on ladies garments i always measure a strap to the bust apex. and i measure a horizontal apex to apex bust measure. Edited by A TAILOR, 18 May 2012 - 02:39 PM. Edited by A TAILOR, 18 May 2012 - 02:43 PM. Just do a men vest and add the chest dart on top and check the front arm scye dept to get enough lenght.